dreams in spanglish: She's only happy in the sun. She's only happy in the sun. When I look back at my summers as a kid, I think of a steady stream of sticky orange dreamsicles, the feel of prickly grass under my bare feet as I ran through the rainbow-forming sprinklers, and feeling like summer was a magic time that might never end. Almost all of my memories are of being outdoors. We used to spend most of our summers in Idaho and Utah, and because of this, those two places will always hold a dear place in my heart. And dreamsicles. This last week, we went to the pool with some of our best friends. Add that to our ever-growing list of why we are loving being back in Utah: hanging out with some of our oldest friends. You know what's great? When your kids are friends with your friends' kids. Plus, I mean, see that little crack-up on the left? She's Junie, and she's a little spitfire. And she and Pato are getting married someday. When asked if Junie was his girlfriend, Pato said, "Yesssss...always." C said, "Are you sure?" His response: "Forever!" She's a real spit fire and we couldn't love these friends any more than we already do. When I think of my own childhood memories of summer, I've started to really pay attention to the things we do, and how our kids will remember their summers. I hope they remember their summer times a lot like how I remember mine. It's because of this I find myself saying yes to one more popsicle, yes to staying up just a little bit later, and yes to getting caught in the rain. I can see the effect summer has had on S, especially. Since the day she was born, she has always been her very happiest when out in the fresh air. Very rarely do I hear her ask to come in from being outside, and she's usually always tricking me into staying out a bit longer. C and I have talked often about how when she was a tiny baby, and we were new parents who didn't have a single clue about how to stop a baby from screaming in the middle of the night, we would take her out into our breezeway and just sit in our glider with her. I remember it being so dark, and the cool air would immediately calm her down. We would sit and stare at the darkness and just swing back and forth. Back and forth. I'd feel my cheeks getting cool, and eventually, she'd fall asleep. This was a special time for us, and even more for C because he was the one who would do it more often. The kids start school soon, and already as I sit here I feel my heart breaking a little bit thinking about how our lives will be jumping back into schedules. Summer may not be my favorite season, but I have to admit, some of my favorite memories are made in this hot hot heat. 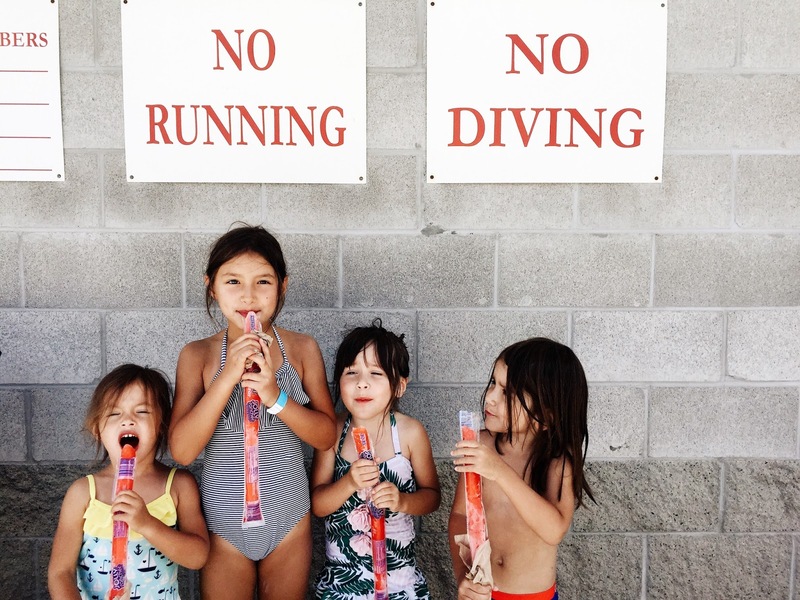 What specific things make you think of your childhood summers? i love this so much! and i love my little spit fire and Pato together "always"! A Year of Oscar: Four Months! Perfect family pictures and a frog button.